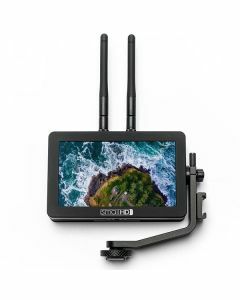 The Small HD Focus Bolt is a daylight viewable camera-top monitor with built in 500ft wireless transmitter that can power your DSLR or mirrorless camera. The Focus Bolt TX builds on the very popular original Focus monitor but now features a built in Teradek 500ft wireless transmitter. The Focus Bolt TX is compatible with the Focus Bolt RX and 703 Bolt as well as Teradek Bolt 500, Teradek Bolt 500 LT and Teradek Bolt 500 XT. Just like the original Focus, the Bolt TX features a 5-inch touchscreen display with 800 NITs brightness, 1280x720 resolution, micro HDMI input and a 7.2v power output to power your DSLR or Mirrorless Camera. All Focus models ship with Small HD's Tilt Arm that allows easy mounting.